Fictitious or fake entries are deliberately incorrect entries in reference works such as dictionaries, encyclopedias, maps, and directories. There are more specific terms for particular kinds of fictitious entry, such as Mountweazel, trap street, paper street, paper town, phantom settlement, phantom island, ghost word and nihilartikel. Fictitious entries are included either as a humorous hoax or as a copyright trap to reveal subsequent plagiarism or copyright infringement. An outright forgery intended to mislead the reader on a matter of substance would not generally be classed as a fictitious entry. The neologism Mountweazel was coined by the The New Yorker based on a fictitious biographical entry in the 1975 New Columbia Encyclopedia. The term nihilartikel combines the Latin nihil ("nothing") and German Artikel ("article"); it can also be written as nihil article. By including a trivial piece of false information in a larger work, it is easier to demonstrate subsequent plagiarism if the fictitious entry is copied along with other material. An admission of this motive appears in the preface to Chambers's 1964 mathematical tables: "those [errors] that are known to exist form an uncomfortable trap for any would-be plagiarist". Similarly, trap streets may be included in a map, or invented phone numbers in a telephone directory. In the United States, fictitious entries may be used to demonstrate copying, but are not always sufficient to prove legal infringement if the material was not eligible for copyright (see Feist v. Rural, Fred Worth lawsuit or Nester's Map & Guide Corp. v. Hagstrom Map Co., 796 F.Supp. 729, E.D.N.Y., 1992.) These traps may still aid in detection of copying and may be proof of copyright infringement if the original material was eligible for copyright. 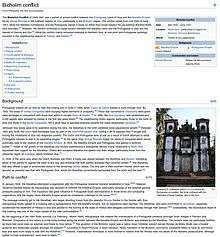 "Bicholim conflict" was a fictitious entry on Wikipedia that lasted from 2007 until 2012. Most listings of the members of the German parliament feature the fictitious politician Jakob Maria Mierscheid, allegedly a member of the parliament since 1979. Among other activities he is reported to have contributed to a major symposium on the equally fictitious stone louse in Frankfurt. The German-language Der neue Pauly. Enzyklopaedie der Antike, edited by H. Cancik and H. Schneider, vol. 1 (Stuttgart, 1996, ISBN 3-476-01470-3) includes a fictitious entry now well-known amongst classicists: a deadpan description of an entirely fictional Roman sport, apopudobalia, which resembles modern football (soccer). Appletons' Cyclopædia of American Biography (1887–1889) contains about two hundred fictitious entries. Zzxjoanw was the last entry in Rupert Hughes’ Music Lovers’ Encyclopedia of 1903, and it continued as an entry in subsequent editions down to the 1950s. It was described as a Māori word for a drum. Later, it was proved to be a hoax (having seemed suspect because Māori does not use the letters J, X or Z). The 1975 New Columbia Encyclopedia contains a fictitious entry on Lillian Virginia Mountweazel (1942–1973). Her biography claims she was a fountain designer and photographer, best known for Flags Up!, a collection of photographs of rural American mailboxes. Supposedly she was born in Bangs, Ohio, and died in an explosion while on assignment for Combustibles magazine. Mountweazel was the subject of an exhibit in Dublin, Ireland, in March 2009 examining her fictitious life and works. The first printing of the 1980 New Grove Dictionary of Music and Musicians contains two fictitious entries: on Guglielmo Baldini, a non-existent Italian composer, and Dag Henrik Esrum-Hellerup, who purportedly composed a small amount of music for flute. Esrum-Hellerup's surname derives from a Danish village and a suburb in Copenhagen. The two entries were removed from later editions, as well as from later printings of the 1980 edition. In August 2005, The New Oxford American Dictionary gained media coverage when it was leaked that the second edition contained at least one fictional entry. This later was determined to be the word esquivalience, defined as "the wilful avoidance of one's official responsibilities," which had been added to the edition published in 2001. It was intended as a copyright trap, as the text of the book was distributed electronically and thus very easy to copy. The German-language medical encyclopedia Pschyrembel Klinisches Wörterbuch features an entry on the Steinlaus (stone louse), a rock-eating animal. The scientific name Petrophaga lorioti implies its origin: a creation of the German humorist Loriot. The Pschyrembel entry was removed in 1996 but, after reader protests, was restored the next year, with an extended section on the role of the stone louse in the fall of the Berlin Wall. Joel Whitburn's pop chart research books say that Ralph Marterie's version of "The Song of Love" peaked at No. 84 for the week ending December 26, 1955. However, Billboard (magazine) did not put out an issue that week, and Marterie never recorded this song. A similar situation occurs in his compilation of Billboard's rock charts, where Whitburn includes the fictitious song "Drag You Down" by the equally non-existent group "The Cysterz". The song "Ready 'n' Steady" by D.A. was long suspected to be a possible fictitious entry on the Billboard chart itself, as it had appeared on the Bubbling Under the Hot 100 chart for four weeks in 1979 despite no commercial copies being pressed; it was eventually revealed in 2016 that the song was real, but that a record promoter had managed to get the unreleased song listed on the chart. Fictitious entries on maps may be called phantom settlements, trap streets, paper towns, cartographer's follies, or other names. They are intended to help unmask copyright infringements; if caught, copyright violators wouldn't be able to explain the entry's presence on their maps. In 1978, the fictional Ohio towns of Beatosu and Goblu were inserted into that year's official state of Michigan map as nods to the University of Michigan and its traditional rival, The Ohio State University. The fictional town of Agloe, New York, was invented by map makers, but eventually became identified as a real place by its county administration because a building, the Agloe General Store, was erected at its fictional location. The "town" is featured in the novel Paper Towns by John Green and its film adaptation. Mount Richard, a fictitious peak on the continental divide in the United States, appeared on county maps in the early 1970s. It was believed to be the work of a draftsman, Richard Ciacci. The fiction was undiscovered for two years. In the United Kingdom in 2001, the Ordnance Survey (OS) obtained a £20m out-of-court settlement from Automobile Association (the AA) after content from OS maps was reproduced on AA maps. The Ordnance Survey denied that it included "deliberate mistakes" in its maps as copyright traps, claiming the "fingerprints" which identified a copy were stylistic features such as the width of roads. The fictitious English town of Argleton was investigated by Steve Punt in an episode of the BBC Radio 4 Program Punt P.I. The program concluded that the town's entry may well have originated as a copyright trap. The Trivia Encyclopedia placed deliberately false information about the first name of TV detective Columbo for copy-trap purposes and then sued Trivial Pursuit (who based some of their questions and answers on the work), without success. The book The Golden Turkey Awards describes many bizarre and obscure films. The authors of the work state that one film described by the book is a complete hoax, and they challenge readers to spot the made-up film; the imaginary film was Dog of Norway, which supposedly starred "Muki the Wonder Dog", named for the authors' own dog. The Urban Legends Reference Pages (snopes.com) include a section entitled The Repository of Lost Legends, containing false discussions of made-up legends (for example, that the bear in the design of the flag of California is a result of a misreading of a handwritten note and that it was meant to be a pear). The aim of the stories in the section is to caution readers against using appeals to authority, and to encourage the checking of references for claims that seem unreasonable; the acronym for "The Repository of Lost Legends" spells out "troll". Within another of the Urban Legends Reference Pages, there are two records of entities that have fallen for the trap, one being the TV show Mostly True Stories: Urban Legends Revealed, and another a trivia board game called Urban Myth. A Fred Saberhagen science fiction short story, "The Annihilation of Angkor Apeiron," in which an encyclopedia article for a star system was a fictitious entry included in the encyclopedia to detect plagiarism, which caused a Berserker ship to end up in an empty star system where it ran out of fuel and ceased to be a threat to humanity. Jorge Luis Borges's Tlön, Uqbar, Orbis Tertius tells of an encyclopedia entry on what turns out to be the imaginary country of Uqbar. This leads the narrator to the equally fantastic region of Tlön, the setting for much of the country's literature. The fictitious entry Agloe, New York, is a key plot point in John Green's 2008 novel Paper Towns and its film adaptation. Paper Towns also references the fictitious entry "Lillian Mountweazel" in the name of the Spiegelman family's dog, Myrna Mountweazel. Australian palaeontologist Tim Flannery's book, Astonishing Animals, written in collaboration with painter Peter Schouten, describes some of the more outlandish animals alive on Earth. They caution that one of the animals is a product of their imagination and it is up to the reader to distinguish which one it is. Rhinogradentia are a fictitious mammalian order, extensively documented in a series of articles and books by the equally fictitious German naturalist Harald Stümpke. Allegedly, both the animals and the scientist were the creations of Gerolf Steiner, a zoology professor at the University of Heidelberg. Each issue of the product catalogue for Swedish consumer electronics and hobby articles retailer Teknikmagasinet contains a fictitious product. Finding that product is a contest, "Blufftävlingen", in which the best suggestion for another fictitious product from someone who spotted the product gets included in the next issue. Muse (a magazine for children 10–14, published in the USA) regularly includes a two-page spread containing science and technology news. One of the news stories is false and readers are encouraged to guess which one. Games (a magazine devoted to games and puzzles) used to include a fake advertisement in each issue as one of the magazine's regular games. In the summer of 2008, state-owned Slovak Hydrometeorological Institute (Slovak: Slovenský hydrometeorologický ústav, short: SHMÚ) got suspicious that a competing commercial service, website meteo.sk was stealing their data. The suspicion grew even stronger when after SHMÚ's three-hour-long website outage the data at meteo.sk was not updated for three hours as well. On August 7, 2008, SHMÚ deliberately altered the temperature for Chopok from 9.5 °C to 1 °C. In a short time, the temperature of 1 °C appeared for Chopok at meteo.sk as well. The ANP in the Netherlands once deliberately included a false story about a fire in their radio newscast to verify if Radio Veronica really had stolen its news from the ANP. Several hours later, Radio Veronica also aired the story. Google, alleging its search results for a misspelling of tarsorrhaphy started appearing in Bing results partway through the summer of 2010, created fabricated search results where a hundred query terms like "hiybbprqag", "delhipublicschool40 chdjob" and "juegosdeben1ogrande" each returned a link to a single unrelated webpage. Nine of the hundred fraudulent results planted by Google were later observed as the first result for the bogus term on Bing. Mailing lists may contain fictitious entries, for instance: lists used to solicit donations. These lists can have considerable value when they contain contact details of people known to give generously to specific types of causes. Mail sent to the fictitious entry indicates that some other party is using a copy of the list. Taro Tsujimoto is a fictional character often included in Buffalo Sabres reference works. Tsujimoto, an alleged Japanese forward, was the creation of Sabres general manager George “Punch” Imlach designed to fool the National Hockey League during the 1974 NHL Amateur Draft; Imlach drafted Tsujimoto and only months later—well after the pick was made official—admitted that the league had been fooled by the fictitious player. Franz Bibfeldt is a fictitious theologian created by Robert Howard Clausen for a footnote in a student paper. Bibfeldt was later popularized by Clausen's classmate Martin Marty as an ongoing in-joke among theologians, including a book and a parody lecture series at the University of Chicago Divinity School. 1 2 "Nihilartikel". World Wide Words. Retrieved 2014-04-23. 1 2 3 Henry Alford, "Not a Word", The New Yorker August 29, 2005 (accessed August 29, 2013). ↑ L. J. Comrie, Chambers's Shorter Six-Figure Mathematical Tables, Edinburgh: W. & R. Chambers, 1964, p. vi. ↑ Fred Greguras, U.S. Legal Protection for Databases, Presentation at the Technology Licensing Forum September 25, 1996. Archived March 1, 2005 on the Internet Archive. ↑ Monmonier, Mark (1996). How to Lie with Maps (2nd. ed.). Chicago: University of Chicago Press. pp. 50–51. ISBN 0-226-53421-9. ↑ Monmonier, Mark (1996). How to Lie with Maps (2nd ed.). Chicago: University of Chicago Press. p. 51. ISBN 0-226-53421-9. ↑ Andrew Clark (2001-03-06). "Copying maps costs AA £20m". The Guardian. Retrieved 2014-04-23. ↑ "Urban Legends Reference Pages: Humor (Media Goofs)". Snopes.com. Retrieved 2014-04-23. ↑ "snopes.com: Mostly True Stories Sixpence Error". snopes.com. ↑ "Urban Legends Reference Pages: Urban Myths Board Game Error". snopes.com. ↑ "Teknikmagasinet – meningen med livet" [Meaning of life] (in Swedish). Teknik magasinet. Archived from the original on April 3, 2008. Retrieved 2014-04-23. ↑ "Microsoft riled by charge Bing is a copy cat". Phys.org. February 2011. Retrieved 2012-11-25. ↑ "Bing Copying Google? Bing Accused Of Stealing Search Results". The Age. Australia. Retrieved 2012-11-25. ↑ ""Hiybbprqag?" How Google Tripped Up Microsoft — Tech Talk". CBS News. 2011-02-02. Archived from the original on 2011-02-04. Retrieved 2012-11-25.